Director Mario Monicelli made some of his best films during what many consider to be the golden age of Italian cinema when that country’s output was among the greatest in popular cinema. He was known for making socially conscious films that mixed comedy with tragedy and were populated by characters that failed more often than they succeeded. Directing some 60 films, he’s best known for Big Deal on Madonna Street (1958), a wildly successful international hit starring one of Italy’s greatest actors Marcello Mastroianni. 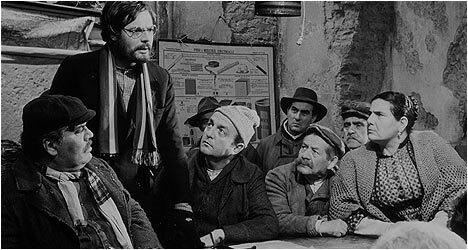 The Organizer (1963) saw Monicelli reunited with the actor on a film that set out to remind audiences just how difficult it is to get workers united for a common cause and then go about achieving it in an organized fashion. Set in Turin during the late 1880s when Italian unions were in their infancy, Monicelli shows, with unflinching realism, the poor working and living conditions these people experienced, accentuated by Giuseppe Rotunno’s stark black and white cinematography. It is a tough existence that Monicelli refuses to romanticize. After one of the textile factor workers loses his hand in an accident, his frustrated comrades vent their anger at the hospital while waiting to see how he is doing. They work long hours in dangerous conditions for lousy wages. To protest, they plan to blow the whistle at work an hour before quitting time and walk out en masse but it doesn’t go as planned because they lack organization. One night, Professor Sinigaglia (Mastroianni) arrives in town on the train – although he looks more like hobo with his ratty clothes than a teacher. He overhears a group of workers meeting about their next protest and offers his thoughts. He ends up inspiring them to go on strike and proves to be quite knowledgeable about strike tactics. Among the moments of levity, Monicelli depicts ones that are absolutely heartbreaking, like when Sinigaglia and a few of his close followers bust down the door of a worker who won’t strike with everyone else only to find him and his poor, starving family living in a shack that is barely held together by wood and mud. Sinigaglia and his crew instantly feel ashamed and we are startled by the appalling living conditions some of these people are forced to live in. It is hard not to sympathize with the plight of the workers in The Organizer as most of them live in abject poverty while the factory owners get richer and richer. We even see their children and their friends enjoying themselves with extravagant parties while their parents scheme ways to end the strike. While the film is anchored by Mastroianni’s performance that, at times, evokes Charlie Chaplin by way of Karl Marx, he often disappears for stretches of time suggesting more of an ensemble piece rather than a star vehicle. Most interestingly, The Organizer ends on a bittersweet note as the status quo is restored but perhaps the workers have been transformed in some small way by their struggle. Mario Monicelli introduces his film and talks about his intentions and how it deals with themes he explored in much of his work. He also talks about how his films were often described as neorealist or “Italian-style” comedies but points out how they broke from their conventions.